I know it sounds crazy, but somehow I feel the same way I did during the weeks that preceded the first day of kindergarten for each of my four sons. On one hand I couldn’t wait to finally see them spread their wings, but on the other, I didn’t want to let go. My two favorite doves, Coo and Flutter, will soon take flight and set their course for many adventures in my DoveStories children’s chapter book series. So, why am I a teary eyed mess? Can you relate to the subject of learning to let go? Or does this sound like nothing more than another ridiculous rambling from a looney bin only a few privileged souls call Dreamdove? Okay. Keep reading anyway. I promise there’s a deep message in this post. Somewhere. All you have to do is look for it. You may not be a writer. Maybe you’re a full-time mom, teacher, medical assistant, business owner, artist, or singer. You nurture. You inform. You help. You learn. You strive. You create. Now can you relate? If so, have you ever wondered why we’re afraid to let go? Of arguements? Of things? Of people? Of stories? Failure is only a word. It holds no power over you or me. Unless we let it. I’ve written and re-written and edited and re-edited. I’ve done all I could to prepare for this moment. I know it’s just a story. I know I can’t control what anyone thinks, believes, or says about it. Or even worse, what anyone thinks, believes, or says about me. I’m just the messenger. Completely Imperfect … Like Coo. One way or another, we all have to press the send button. Because when all is said and done and we get to the end of ourselves, we all have a choice to trust God, or the stars, or nothing, with our babies. What if our stories find a life of their own through the most grueling life lessons that finally set us free to become who we were always meant to be? Maybe that’s how stories worth telling are born. A cast of unlikely characters can leap (or fly) off every page with the hope of a simple mission that holds the power to touch innocent hearts and transform ordinary lives into extraordinary ones. I’ve come to believe one man’s thought of literary junk really is another’s genius. Just saying. And maybe, authors, like moms and dads, are partial to our little Einsteins. No matter what the world thinks. Even when … (fill in the blank for your life). We hope and pray everyone will love and accept them. We tell ourselves it’s okay if they don’t. And then we cross our fingers just in case we’re lying without meaning to. We’re vulnerable. We live in a subjective world. Period. When the world thinks our babies are ugly, we know the world needs glasses. When a teacher says your child talks too much in class and needs meds, you think the teacher may need a glass of chilllaxor every now and then. When our stories, like each child we birth and teach and love, are ready to take on a life of their own, we must step aside to let it happen. We move on because we know that we know that we know we have to. You and I were meant for this moment. You were created to do amazing things right where you are. Know you are loved. These two wacky doves (Coo and flutter) have been part of my imagination, my life, and my family’s lives for several years. They’ve become more than children’s book characters to me. 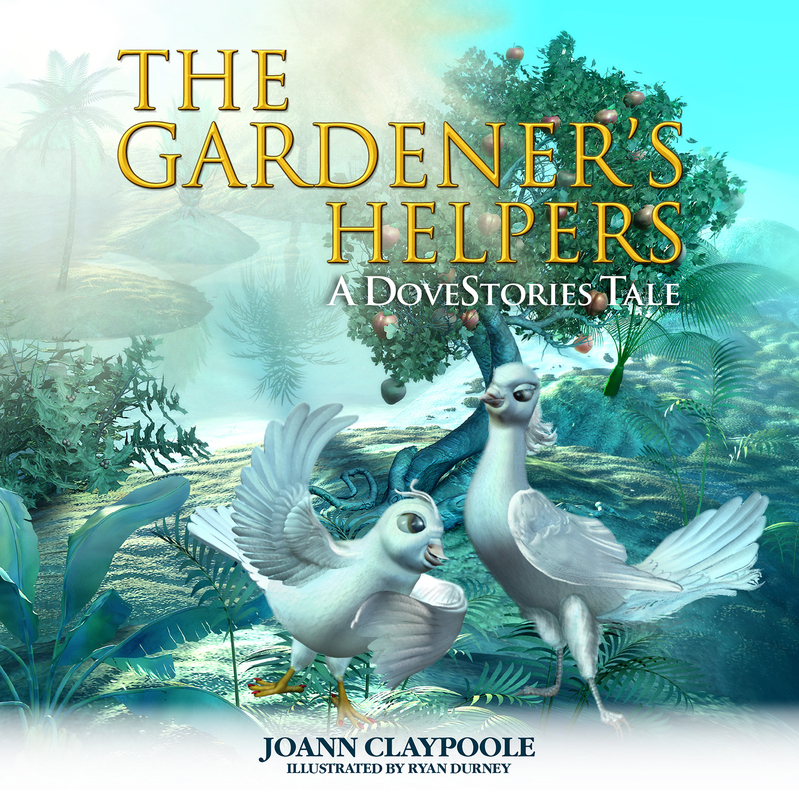 My only hope is this first DoveStories tale, “The Gardener’s Helpers” touches you and your child’s imaginations and hearts with their innocence, mission, and love. PLEASE HELP US as we gather Coo and Flutter’s launch team during the next few weeks leading up to the Sept. 1 book release date. Would you like to take part in The Gardener’s Helpers launch team events? We need your help to spread the word! Email joannclaypoole@comcast.net, FB message, or text me for details. Launch team members will receive a FREE PDF copy of our story from Morgan James Publishing and are requested to post a brief honest review on Amazon, Goodreads, and/or other book sellers sites, on (or soon after) launch date. Check out my FB page for upcoming info. Enter our goodreads book giveaway contest July 31-August 31 at: goodreads.com/joannclaypoole Click on The Gardener’s Helpers book title to get to the giveaway page / instructions. Check out my official website: joannclaypoole.com for more news about DoveStories, books, and missions I’m passionate about.